An example of data recorded for a feature in Bingham. This is a display of the data in the database for Feature BIN.SHE1. This is a feature in Bingham, where the adjacent parish is Shelford. 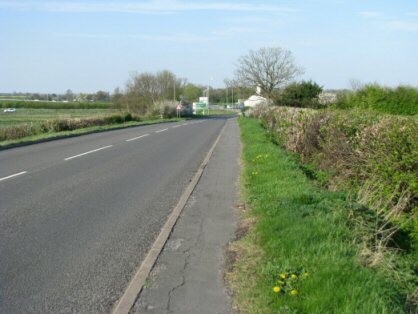 The photograph is of the Fosse Way and field boundary marking the western boundary of the parish. The view is to the north and the site of Margidunum, a Roman town, now a roundabout on the old A46. If you have selected Other please give a feature type. Boundary type - select any that apply. Yellow background means your entry has less than 6 digits. Flora - select any that are present. Two-lane A46 (old road), the Fosse Way. It has now been remodelled since the new A46 was completed and opened in 2013 and is interrupted with a roundabout. The northern end of the feature is a spot in the middle of the Margidunum roundabout where the parishes of Bingham, East Bridgford, Car Colston and Shelford meet. The old Fosse Way is thought to be originally a Roman road. The north end of the feature lies within the Roman small town Margidunum. The road is shown on a drawing made by William Stukeley in 1723. Copyright. CBA East Midlands. All rights reserved.